While Game of Thrones is mostly about the same core characters each year, the series does bring in a revolving cast of characters from George R.R. Martin’s Song of Ice and Fire series. 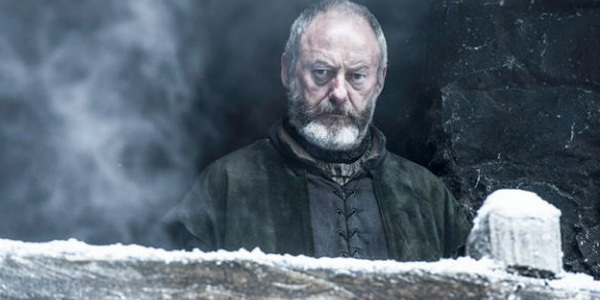 We already know about a few of the new characters who will be showing up in Season 6, but this week actor Liam Cunningham, who plays Ser Davos on the show, confirmed one more big casting. As it turns out, Lyanna Mormont will appear in the upcoming season of the HBO drama. Here’s what the actor had to say about a certain scene from the trailer, which mentions Davos talking about a war with the dead. Who I'm saying that to is a fabulous young actress who you haven't met yet, who's about to come in, who's Lyanna Mormont. He's explaining the situation to her because certain other individuals are making a mess of their parlay. He's very good at lateral thinking and explaining the situation, as we know. The real war is between the living and the dead, and make no mistake, the dead are coming. This line is one of the key moments in the footage that we’ve seen—along with Sansa finally coming into her own as what looks to be a warrior maiden—and Ser Davos elaborated a bit more about the line to IGN. Along with revealing the line is meant for Lyanna Mormont, he also talks about the more important war to come, noting that nearly all of the characters on Game of Thrones are currently missing the point. The Night's King is coming. You ain't gonna kill him with a bow and arrow. We need to do something, rapidly, but they've all got their heads up their asses with their own little squabbles. Obviously, Westeros is about to have a big problem on its hands. We’ve been waiting for months to see how things shake out as the weather gets colder and the dead get closer to civilization. Luckily, we (finally) don’t have too much longer to wait to see how things pan out. Game of Thrones returns to the schedule on Sunday, April 24 at 9 p.m. ET. If you’d like to know what to expect from Season 6, check out our full guide outlining details about the upcoming season. In addition, if you’d like to hear Ser Davos discussing the war with the living and the dead, you can check out the trailer, below.